Image from: Leslie's. 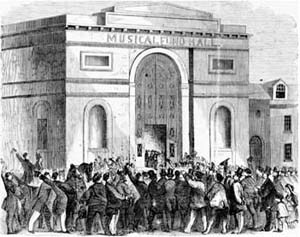 Republican Convention Announcement of the Nomination at Musical Fund Hall, Philadelphia. July 5, 1856. p. 53. Also visit : The Crisis of the Union: An Electronic Archive of Documents about the Causes, Conduct, and Consequences of the Civil War. Created and Maintained by SCETI (Schoenberg Center for Electronic Text and Image).